Thanks to a kind donor of the g4u project, I found Jun-ichiro itojun Hagino's book "IPv6 Network Programming" in the mail today. 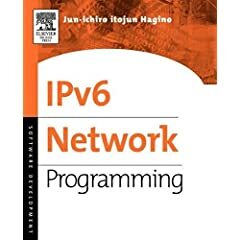 The book consists of two parts: the first one talks about IPv6 programming, and the second one lists a number of relevant RFCs. The Programming part includes an overview of the IPv6 APIs, puts emphasis on writing address-independent programming and gives a fair number of guidelines in that area. It then describes details for porting applications to support IPv6, with details on what to look for in client and server code, followed by a number of tips for IPv6 programming. A practical example that shows how existing client and server applications (nail and popa3d) can be changed to support IPv6. The second part of the book consists of 270 (of ~360!) pages of printed RFCs, which is a bit over the top IMHO - if I'd wanted to read them I would know where to find them. On the other hand I have them all in one place, so I guess that can be excused. Overall the book is rather technical and very much on the spot, written for people with programming and Unix background to learn on how to get the job done without much fluff. Minor nits are the long appendix and that images appear a bit blurry, but that shouldn't stop anyone from reading the book - go for it! Check out the book's website for more information. Update: I should have done more research, apparently it's only one chapter that's online. As a reparation, here's really a full version of another book that you may consider worthwhile to have a look at: Ross Anderson: Security Engineering, found via Fefe's blog (well, actually Stefan pointed it at me before I could have my daily dose ;). In his latest book "Code Quality: The Open Source Perspective" almost all of the 623 examples are drawn from actual code, and NetBSD is the primary package he used for drawing examples. For more details you can see Diomidis' posting to the netbsd-news list or visit the book's web site. There was a nice posting on slashdot about this example of a programmer's bookshelf, which is pretty neat to move your mouse over the picture of the shelf and see the various covers. Not 100% my choice of books, but pretty close esp. when it comes to some of the basics (Knuth, Stevens). Andrew Tanenbaum: "Modern Operating Systems", for theory and basic principles on processes, memory management, synchronisation, file systems, etc. There are alternative authors like Silberschatz on this level, I tend to like Tanenbaum best. Various implementation discussions that are available, e.g. Marco Cesati and Daniel P. Bovet: "Understanding the Linux Kernel"
Marshall Kirk McKusick: "Design and Implementation of the 4.4BSD Operating System"
Benny Goodheart and Jamex Cox: "The Magic Garden Explained: The Internals of Unix System V Release 4: An Open Systems Design"
... plus assorted digging in your NetBSD, OpenSolaris, Linux or whatever operating source code. Uresh Vahalia: "UNIX Internals: The New Frontiers", for advanced theory on topics like synchronisation in parallel systems, advanced memory management, etc. Jim Mauro and Richard McDougal: "Solaris Internals", for a discussion of all the advanced features and their implementation. The general approach here is: theory, practice, theory, practice. There may be other good books, maybe I forgot about them, maybe I don't know - feel free to remind me!